CAE's policy on lab machine logins: "You may not be simultaneously logged into more than one workstation." In other words, one login for one user. To enforce this, we have deployed a program called UserLock to the Windows lab machines. "You reached the number of allowed initial access points. You need to close one of the following sessions in order to logon. Please select the initial access point you want to close and click on Close. 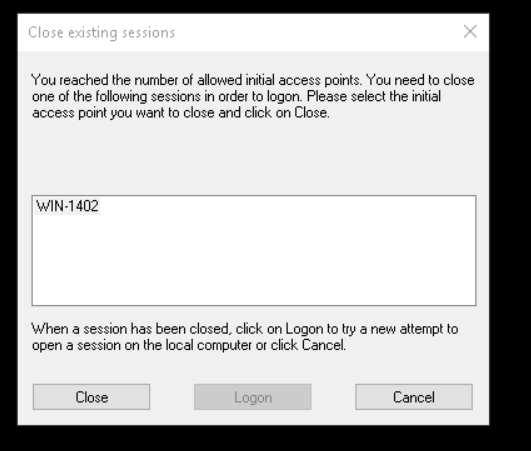 When a session has been closed, click on "Logon" to try a new attempt to open a session on the local computer or click Cancel." "You cannot connect because the blocking session may not be logged off yet or because there is another blocking session. Please try to click on "Logon" again or to logoff another session. 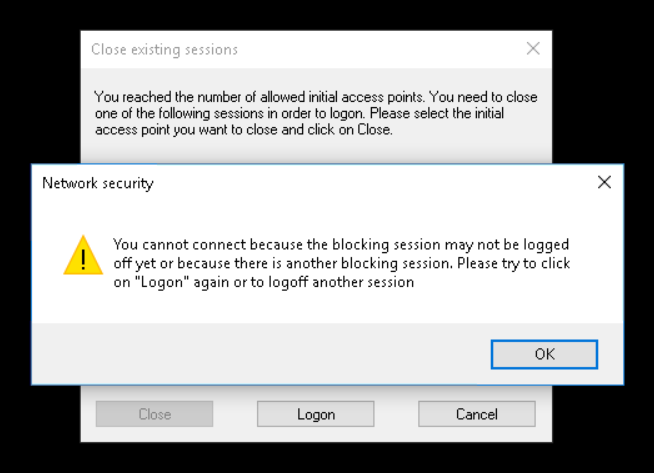 Please try to click on "Logon" again or Close to log off another session." This message may come up if you click the Logon button immediately after you hit the button to Close another session. It can take a few seconds to end a previous session.